More and more kids are leaning on their parents. This isn’t about property. This is just how the rat race works. One of the richest nations on earth, and we’re all still struggling. Not living in a shanty-town on some Indian rubbish tip struggling, but still, 60 odd years of economic miracles and how much relaxation do we have to show for it? And maybe some boomers are coming in to retirement, feeling like they might be able to enjoy a well-earned rest. But then their kids are facing the prospect of being locked out of the housing market if they don’t step in to help. Last year, a survey by comparison website Finder found that one in six Australian parents gave their children financial help to purchase their home, mostly with help stumping up a deposit. And this is one of the features of the Australian property market. Mortgages are no harder to service than they were 20 years ago (thanks to falling interest rates), but deposits are harder to come up with. They reckon the proportion of first home buyers signing up for loans with the bank who have the backing of a family member has lifted to 6.7% from 4.8% in 2010. 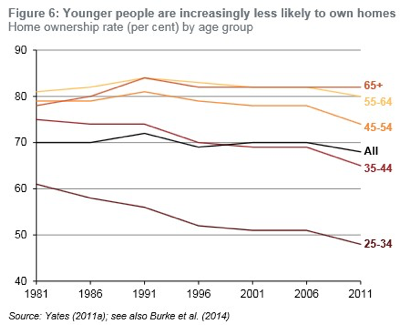 The data does show that home ownership rates for younger people have been falling. In 1981, over 60% of people aged 25-34 owned their own home. In 2011, that was down to less than 50%. Keep in mind though that this coincided with the broader fall in ownership rates, as Australian investorship rates rose, as well as with the rise of the first-time investor. So it’s not quite as bad as all that. But still, I’m not going to tell kids it’s easy. And the point is that this impacts on the older generation as well. What’s the point of busting a gut you’re whole working life, only to find out a good chunk of what you’ve put away is now needed just to help your kids get a house? Now it’s always tempting to blame ‘greedy’ investors for pricing the kids out of the market. But I think this misses the point. Because we’re not just talking about housing. A few weeks ago, a survey by Super Fund Rest found that one in three grandparents are planning to draw down on their superannuation to pay for their grandkids school fees. What we’re talking about is the rat race. And the point is that it’s not just about where you are in absolute terms. But in a market where there is free competition for goods and services, and when that competition sets the price, then it’s not your absolute position. It’s your relative position. It’s where you’re placed in the great rat pack. And we’ve got an economic system that relies on growth. It’s like a shark. If it stops moving, it dies. And so the system relies on whipping the rats along faster and faster. And if the system starts to stall, we ask the politicians to crack the whip a little harder. I definitely don’t think you’d design a system this way. But all of this rat racing is hidden from us to a degree. And that’s because the prices of pretty much every manufactured thing have been falling. Think about computers. $1000 buys you a tonne more computer now than it did ten years ago. And so that gives us the feeling that we’re getting ahead. And it is true, in a way, that massive deflation in most things in the economy gives us the feeling that we’re getting wealthier. But the nature of the rat race means that those wealth gains just get transferred somewhere else. Save $500 on a computer, and that’s $500 to spend somewhere else. And so we only see the full extent of the rat race in things that are in fixed supply. Things like land and property. Growing incomes and a falling general cost of living have simply translated into higher property prices. (Well, its one of the factors driving prices). The more money we have in our pockets, the more money we have to bid up limited real estate. And the wealthier nan and pop become, the harder it is for the kids to buy houses, the harder they lean on nan and pop. Is there a net gain? I don’t want to be too much of a downer. I wouldn’t swap living in Australia for anything. Life is awesome, and we’re all doing the best we can. And I think we can say that life is better now than it was 50 years ago… can’t we? My only point is, when some resources are limited (like land), we create a rat race. That rat race will then turn around bid up the price of things like land. It’s not enough to just keep pace with the rats. You need to jump exponentially ahead of the pack if you want to relax. And in my mind, assets that are pumped most by the rat race, are exactly the vehicle you need to do that. It’s why I’m a property nerd. It’s a bit of an ugly truth, but this is the system we’ve got. You either work with it or you don’t. And I don’t see any alternatives on the horizon. 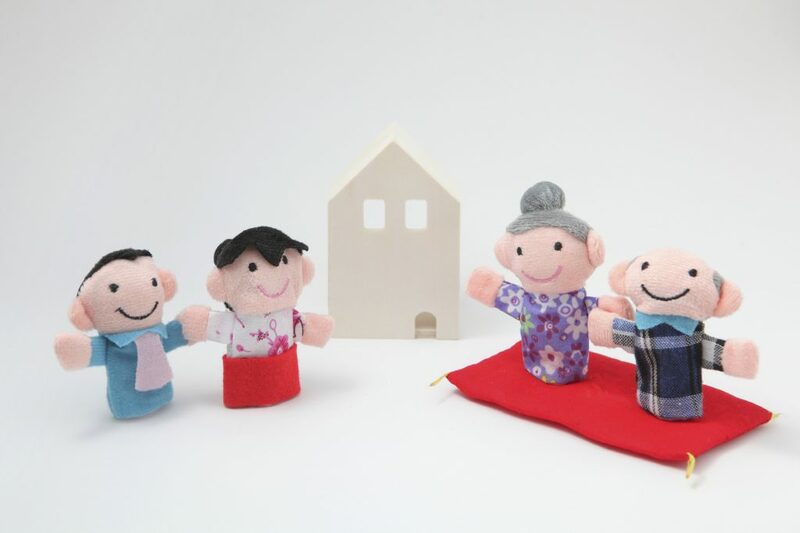 Have you helped your kids get into the property market? Is this the only way in for new entrants to buy a property? Should kids be living at home longer with their first property purchase being an investment?